I optiske sorteringsanlegg på Haraldrud og Klemetsrud skilles blå og grønne poser fra restavfallet. Oslo is a pioneer with regards to circular economy. The goal is that the least amount of resources is wasted. A circular economy is based on reuse, repair and the recovery of materials, and it depends on a proper cooperation between consumers, manufacturers and public authorities. The goal is that fewer resources are wasted. Oslo's waste management system has come a long way towards achieving this goal. In Oslo, collaboration between the municipality and the population results in the efficient use of resources. The inhabitants sort their waste at home, which is later converted into energy and new products in the waste management facilities of the municipality. After the residents of Oslo have sorted their waste at home, it is collected by the municipal Agency for Waste Management, which takes it to the waste facilities. There, the Waste-to-Energy Agency sorts the household waste and produces district heating, biogas and biofertilizer. This resource-focused way of thinking is the main force behind a circular economy. 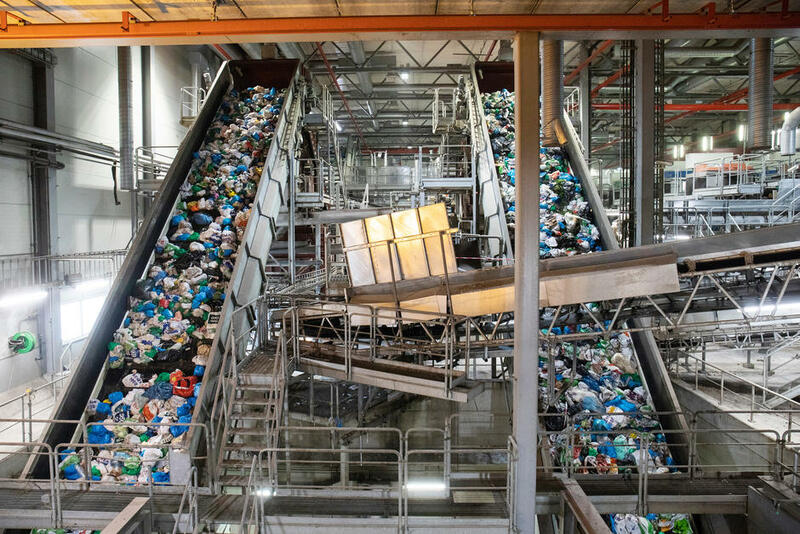 The waste is sorted through an optical separation system at Haraldrud and Klemetsrud, where green bags containing food waste and blue bags with plastic packaging are separated automatically from the residual waste. The food waste, together with other biological materials, becomes biogas and biofertilizer, while the plastic waste is handled by Grønt Punkt Norway (Green Dot Norway) and ends up as new plastic products. The residual waste is incinerated and becomes district heating for Oslo's population. It is at the municipal biogas plant in Nes on Romerike that Oslo's food waste and other biomasses become carbon neutral biogas and organic biofertilizer. The biogas is upgraded in the gas plant, and becomes a CO2-neutral fuel for buses and other types transport. The nutritious biofertilizer is used in agriculture. The district heating in Oslo consists mainly of energy from waste (63.9%), but also from electricity (24.6%) (mangler parantes i den norske teksten), and heat pumps from sewage plants (7.8%). District heating extracted from the sewage alone supplies the city with heating for up 13,000 apartments a year. The energy production of the Waste-to-Energy Agency contributes to achieving the ambitious climate and environmental goals of the City of Oslo, which is to reduce its CO2 emissions by 95% by 2030. Oil heating in Oslo is about to be phased out, and the share of district heating from waste incineration increases. Biogas is one of the most environmentally friendly fuel alternatives available today. Biogas production will help reduce CO2 emissions from traffic in Oslo. This reduces the total amount of greenhouse gas emissions. In Oslo, there is also a separate pilot project for carbon capture and storage (CCS) at Klemetsrud. If the carbon capture plant is realized as planned, it will be the first of its kind in the world. You can read more about carbon capture and storage at Klemtsrud here.